Nokia 6 and Samsung Galaxy J7 Prime comes with a Metal body and Fingerprint Scanner on the front. On display Nokia 6 comes with a 5.5-inch (1920 x 1080 pixels) 2.5D curved glass display Corning Gorilla Glass 3 protection compared to 5.5-inch Full HD 1920x1080 pixels) TFT display. Nokia 6 is powered by a 1.4GHz Octa-Core Qualcomm Snapdragon 430 SoC with Adreno 505 GPU Galaxy J7 Prime has Samsung's own Octa-Core Exynos 7870 SoC with Mali-T830. Nokia 6 comes with a 3/4GB of RAM with 32/64GB of internal storage whereas Galaxy J7 Prime has a 3GB RAM and 16GB/32GB storage both supports MicroSD card. Coming to camera Nokia has a 16MP rear camera and 8MP front facing camera compare a to 13MP rear camera with LED flash, f/1.9 aperture and 8 MP front on Galaxy J7 Prime. Nokia 6 runs on Google's latest Android Nougat Samsung Runs on Marshmallow. 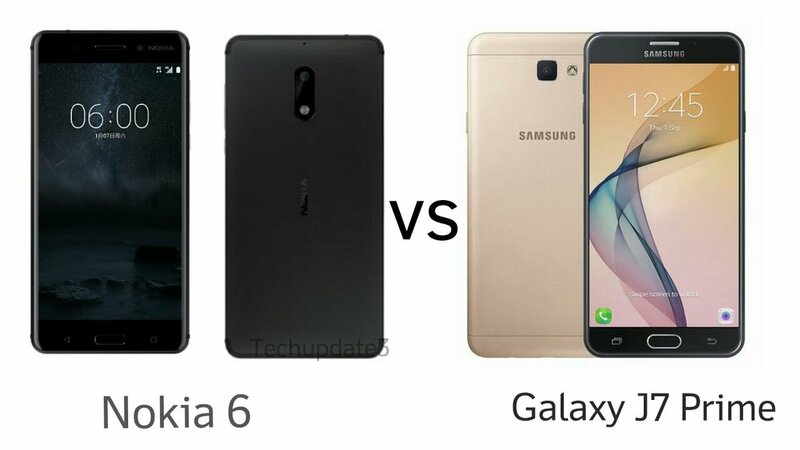 Galaxy J7 Prime has a 3300mAh battery whereas Nokia 6 has a smaller 3000mAh battery. OS- Android 7.1.1 (Nougat) Android 6.0.1 Marshmallow.